Looking northwest up the Andrews Hwy in 1961. The edge of town was near Midland Dr. and where the Loop exists today it was then ranchland. The large vacant tract of land running diagonally near the bottom of the photo later became the Gibsons Discount City. The Gibsons building still exists today but is occupied by multiple tenants including Hastings Book and Records. 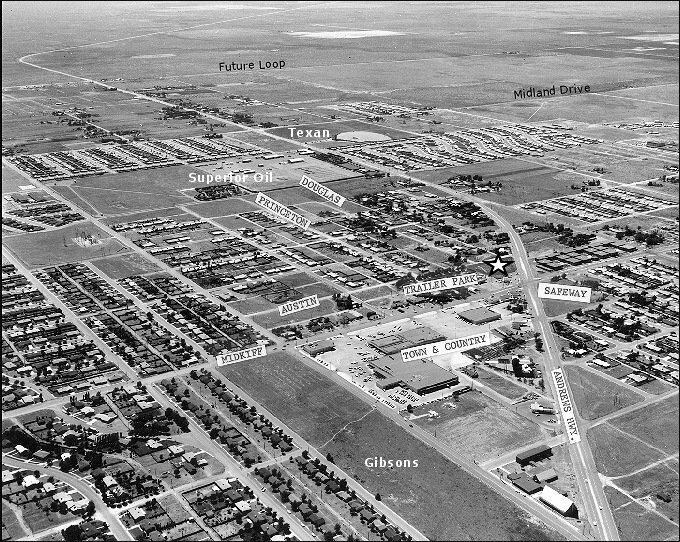 The vacant land near the bottom right corner is now the site of the shopping center where Albertson's is now located. The Texan Drive-In movie theater is seen near the middle top of the photo and directly across Andrews Hwy was the Superior Oil Camp where families who worked for that company lived until the mid 1960's.